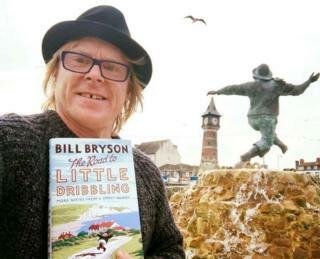 Image caption Skegness town councillor John Byford (pictured) said the use of the image showed Jolly was "still firmly planted in the public's hearts"
Bill Bryson's latest book can continue to use a cover image of Skegness' Jolly Fisherman published without permission. Skegness Town Council - which owns the copyright - accepted the publishers had made a "genuine mistake". Town clerk Steve Larner said: "Because Jolly is so prevalent they hadn't realised the image was under copyright". Publisher Transworld has now agreed to credit the image in future prints. Mr Larner said he had spoken to the publishers, who had now submitted an application he was "happy" with. In the book, which marks the 20th anniversary of Bryson's previous best selling travel diary, Notes from a Small Island, the author is not entirely complimentary about the resort. One line says: "As far as I could see, there was nothing wrong with Skegness that moving it eight hundred miles south wouldn't fix." Another extract, detailing his drive through Lincolnshire, reads: "I was so half mad with boredom that I began to fantasize about trying to jump the car over the roadside ditch and see if I could land upright in a potato field. "I figured the worst possible outcome was death, which didn't seem so bad compared with continuing on to Skegness." However, he does pay homage to the Jolly Fisherman. "That understanding [that Skegness is bracing] dates back to a 1908 poster by the illustrator John Hassall, which shows a cheerful and portly fisherman skipping along the beach above the caption 'Skegness is SO bracing'." "That one image and four simple words have made Skegness famous," he wrote. "Hassall was paid twelve guineas for the work. The original hangs in Skegness Town Hall. I would love to have seen it, but the building was closed as it was the weekend." The poster featured the slogan "Skegness is so bracing"
Transworld Publishers said: "The use of the Jolly Fisherman was inspired as a tribute to the iconic nature of the image, which Bill writes about with much affection in his chapter about Skegness. "Given how extensively the image has been reproduced in the past, it was presumed the image was in the public domain. Now it has been established the image is in copyright until 2018, we are in contact with Skegness Town Hall to confirm permission."